This project started as a bathroom remodel which became a master suite makeover. 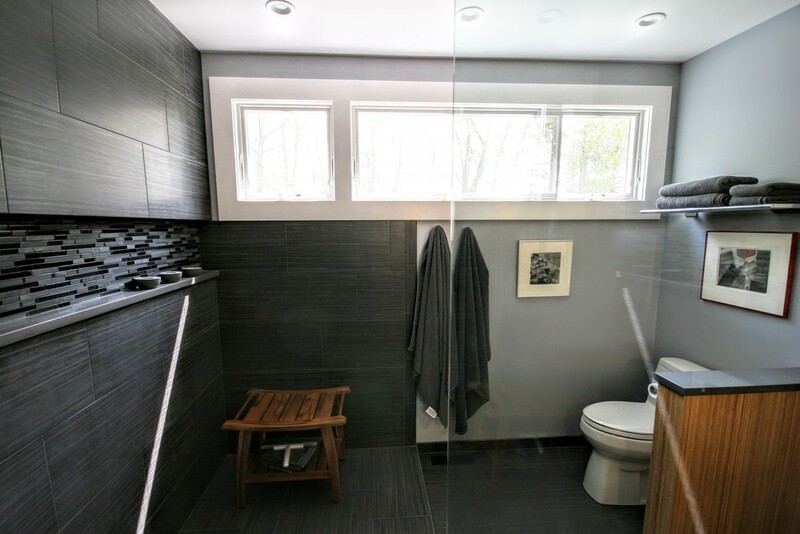 The original bathroom contained a large closet, plastic shower enclosure and a small window. As you can see in the pictures below, we enlarged the space both physically and visually by removing the walls and installing a transom style window which provides lots of natural light , yet plenty of privacy. There is extensive custom tilework throughout this bathroom. The shower features a slot drain, zero curb and river rock tile. There is in-floor heat under all of the tile. The vanity which is custom designed and built, provides plenty of storage. We rounded off this project by installing prefinished bamboo flooring in the master suite and by replacing all of the doors throughout the house with solid 5 panel shaker style doors. 12x24 Porcelain tile on walls and floor. Grouted with epoxy grout. Glass tile mosaic in wall alcove. Grouted with epoxy grout. Slot drain with removable cover. Kohler wall sconces with LED night lights. Kohler triple recessed medicine cabinet. Silestone waterfall quartz vanity top. Custom plank tile floor with epoxy grout. Andersen Windows triple awning unit. New solid 5 panel doors with custom trim-work. 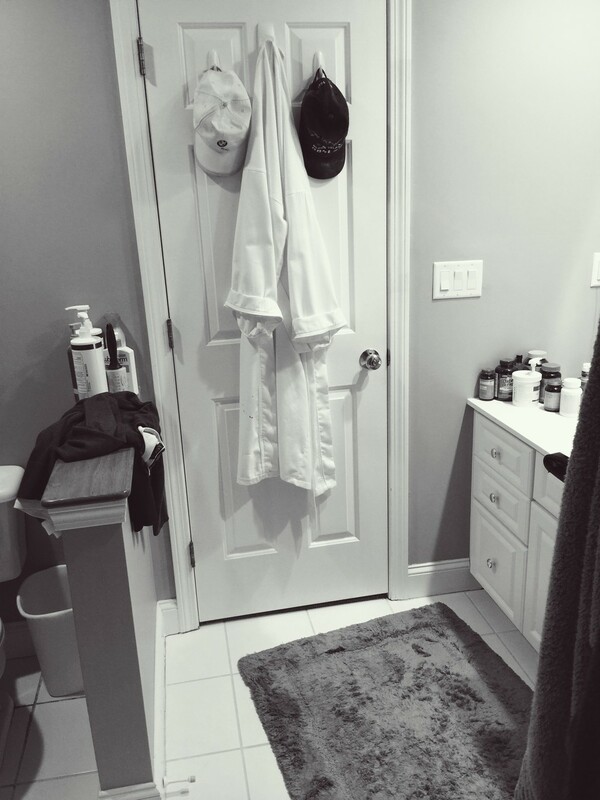 "After 17 years of living with 2 white on white on white bathrooms I decided to redo both at the same time. I found @designREMODEL on-line and after my first meeting with John I knew his firm was the right one for the job. Even in the first meeting I could tell he was very attentive to the details and would make the experience go as smoothly as possible. I had an idea of what I wanted but John was great at bringing ideas to the table and his entire team of craftsman were always open to changes and new ideas. And there were quite a few changes. The project expanded to include not just 2 full bathrooms, one of which had to remain somewhat functional as I was living in the house throughout the project, but a laundry area, wood floors in a master bedroom and the replacement of all interior doors. Mike, Adam, Al, Rick and Kemp all did an incredible job throughout all aspects of the job. Everyone John brought in had a similar attention to detail and was always open and accommodating to my last minute changes. They always took care to make sure the house was as put together and clean as possible during the 3 month project. As with any renovation there were issues along the way but they were always handled professionally and solved as quickly as possible. The project is complete and in addition to unbelievable bathrooms I feel like I have a brand new house. I was so pleased with the overall renovation that I have already secured John and his team for another project. It is never easy to live through a renovation but the process and end result were well beyond what I could have hoped for."